In the second part of this work, silane-pretreated epoxy coatings on aluminum substrate are theoretically studied by molecular dynamics simulation. The results show that (3-glycidoxypropyl)-trimethoxysilane (GPTMS) provides improved interaction energy for aluminum and epoxy interface and thus ensures satisfactory adhesion. 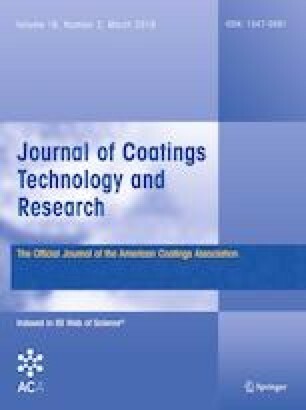 Water diffuses fastest and slowest across the interface of bis-1,2-(triethoxysilyl)ethane (BTSE)- and GPTMS-pretreated painting systems, respectively, suggesting that BTSE has the worst and GPTMS provides the best capability for constructing a reliable interface among the selected painting systems. The existence of both silane pretreatments improves the resistance of structure relaxation of the epoxy polymer chain to water penetration. This work was supported by National Key R&D Program of China (2017YFB1200800), NSF of China (Nos. 51371159 and 51671174), and Zhejiang Provincial NSF (LZ17E010001). J.-M. thanks Dr. Qiong Feng for valuable discussion.